Professor Gigi Panagotacos is the Assistant Director for Collection Management and Research Librarian at Faulkner University, Thomas Goode Jones School of Law Library in Montgomery, Alabama. Professor Panagotacos joined the law library faculty in 2005. Prior to coming to Faulkner University, Professor Panagotacos worked at several academic law libraries as a law librarian. 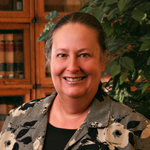 She has taught courses in advanced legal research in addition to teaching as a legal research and writing instructor. Professor Panagotacos obtained her undergraduate degree, juris doctor, and library science degrees from Florida State University. She is a member of the Florida Bar.